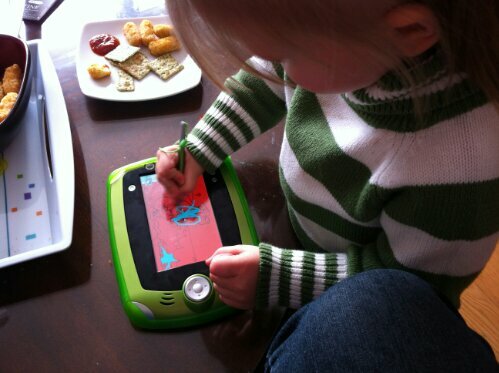 This year as a gift from her Papa, The Bug received a LeapPad 2 made by LeapFrog. The age group suggested by the manufacturer is 4-8 years old so obviously she has a bit of growing into it to do. With over 350 downloadable apps, a sturdy make and both front and back cameras, it’s easy to see the appeal that many kids have for this toy. With the LeapFrog Connect program for your computer, you can download apps instead of buying the cartridges from the store as well as watch a trailer for the app first. If you have any other LeapFrog systems you can also use the program to track what your child is learning and playing with the most. The apps available range from games to learning tools to music and have a price point of $5-30. So far for The Bug, we have been getting the most use out of flashcard type games and colouring apps. If your child is right at the age where they are showing an interest in reading, this is also a great toy to have. You can purchase ebooks in the app store and the LeapPad 2 has a built in Tag reading program. This program has a few options for your child. They can have the book read to them, have help with individual words when reading themselves, or some books will even sound out the word. All in all I’m highly impressed with the LeapPad 2! The Bug has already gotten so much enjoyment out of it and I can’t wait for her to grow into it more. Ava was glued to that toy for ever!